The Euro traded positive on Wednesday after extending August 6 bounce from 1.1530 against the US Dollar. The forex market is trading in a risk aversion environment inside the low volume summer season. EUR/USD closed a directionless Doji candlestick on Wednesday as the pair extended gains for the second day but the range was small. Currently, EUR/USD is trading at 1.1611. According to Yohay Elam, FXStreet analyst, the US dollar remains as the dominant of the market and “each breather looks like a buying opportunity.” Elam states that three main factors are making the USD dollar buying case: 1. Strong economy according to the hard data; 2. Trade wars and the elections; and 3. Hawkish Fed for now. 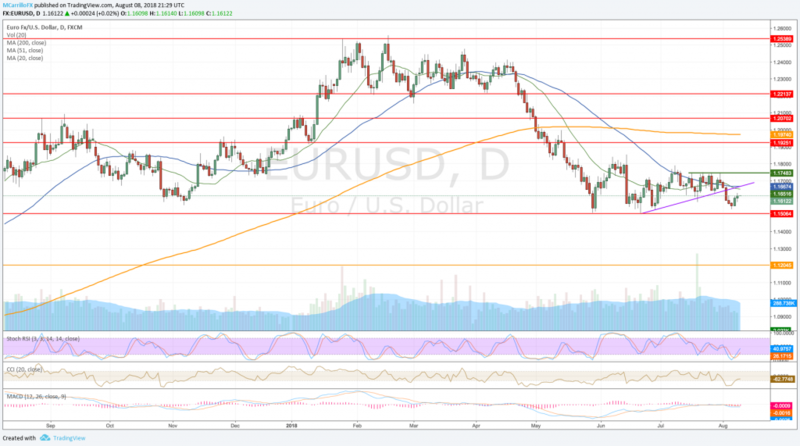 Back on the chart, the https://www.investingonline.com/charts/eurusd/EUR/USD looks ready for a recovery path from its bounce at 1.1530. The pair is now trading above the 1.1600 area with the confluence of the 20 and 50 days moving averages acting as next resistance. 1.1660 is now the level to break. Above there, the Euro will face the critical 1.1750 that has been containing the pair in the last month. Then, check the 1.1800 and the 1.1840 as next selling zones. To the downside, If the pair is unable to break above the 1.1660, a consolidation below that level would expose weekly lows and negate the upside bias. Then, the cross will return to August 6 low at 1.1530. Also, check for the 1.1500 area as the ultimate support.